From the moment he saw the product at the Hong Kong Gifts and Premium Show in April 2008, Eric King knew he’d found something special. Six months later, just in time for Christmas, he introduced the Shred Sled in the United States — and watched it sell out. He trademarked the name The Shred Sled, contacted creative designers with whom he had previously worked to develop the packaging, and ordered a full container — 2,200 units. Eric described the Shred Sled as bringing the thrills and carving movements of snowboarding to the streets. “It combines snowboarding and skateboarding,” he explained. 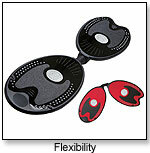 “The four inline wheels provide a smoother ride and much more control than the usual two wheels. The concave decks make for better foot control. The component in the middle is flexible, which is different from older models, making for tighter turns and more tricks.” He added that the polyurethane wheels and bearings are smoother and stronger than on other boards, and rarely need replacement. Of course, he’s looking forward to carving an even bigger success this year. This 4-wheel, dual-deck carve board makes it smoother and easier to start carving up the streets. Its fun and much easier to control than older 2-wheel generation boards. The 4-80mm polyurethane wheels and ABEC-5 Bearings are smoother and stronger and rarely need to be replaced. Due to the inline wheels, the Shred Sled offers the feel of snowboarding while skateboarding. Editor's Note: Effective September 2010, the recommended retail price for the Shred Sled is reduced from $119.99 to $59.99. According to a press release, "The affordably priced Shred Sled will offer all of its original features that have proven to be a major success, including 4 x 80mm polyurethane wheels and ABEC-5 bearings."